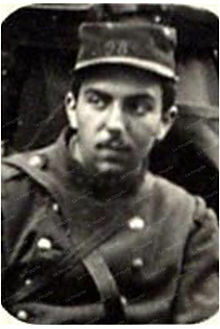 On this date in 1914, the French army shot Lt. Jean-Julien Chapelant as a coward. Most resources about Lt. Chapelant are in French, as are almost all the links in this post — but within France this case has been contested since the interwar years when his father fought in vain ferocity to reinstate the honor of his son. While the categorical rehabilitation of Great War soldiers “shot at dawn” as cowards or deserters has been a going concern in recent years, Chapelant also has a compelling individual argument that he ought not have been construed such even by the standards of his time. The luckless lieutenant was shot for “capitulating in open country”. This was at best an extremely prejudicial interpretation of the facts, seemingly one that commanding officers themselves still adjusting to the unexpected prowess of German arms had already settled upon before any proper investigation, out of their pique at losing the position. The verdict was so certain that Chapelant’s commanding officer gave him his revolver back urging him to “burn out his own brains” and save everyone the trouble. Chapelant refused, insisting that he had done his proper duty, and military justice was edified by the spectacle of a crippled man who could not stand propped up in his stretcher against an apple tree for the tender ministry of his firing squad. Although we have been treated in these pages to the heartbreaking scene of an officer comforting a man about to be shot with the remark that “yours also is a way of dying for France,” the idea has until very recently been confined to the precincts of personal sentiment and certainly not to the institutions responsible for the dying. * Adding round numbers is hard, apparently.